TUBE UNION RMT today secured a massive victory for low paid workers as it was confirmed today that all tube cleaners will be paid the London Living Wage of £7.85 per hour backdated to the 1st of July. 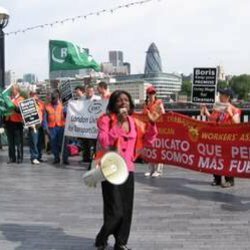 RMT has mounted a long and hard campaign for the cleaners to be paid the London minimum and the final group, the Tube Lines cleaners working for ISS, will at last join their colleagues on a decent rate of pay from this month. “This is a massive and historic victory for RMT and our London Underground cleaners and will come as a boost for other low paid workers right across the city. It shows very clearly that if you join a union, get organised and stand up and fight then you can win major improvements to your rate of pay. 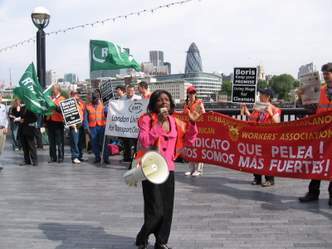 “For years we have mobilised the cleaners and mounted demonstrations – often in the teeth of the most outrageous intimidation – and today we see the culmination of that industrial and political pressure with this ground-breaking agreement on pay. “It is a tribute to the solidarity, bravery and resilience of our members and their reps that they have stood firm and won this truly inspirational victory.